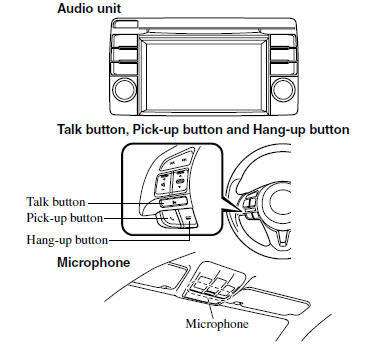 When a Bluetooth® device (mobile phone) is connected to the vehicle's Hands-Free unit via radio wave transmission, a call can be made or received by pressing the talk button, pick-up button, hang-up button, or voice command on the steering wheel, or by operating the panel. For example, even if a device (mobile phone) is in your coat pocket, a call can be made without taking the device (mobile phone) out and operating it directly. When a portable audio unit equipped with the Bluetooth® communication function is programmed to the Bluetooth® unit, you can listen to music recorded on the programmed portable audio device from the vehicle's speakers. It is not necessary to connect the portable audio device to the vehicle's external input terminal. After programming, operate the vehicle audio control panel to play/stop the audio. The audio unit (Type B) is used for volume adjustment and touch panel operation. Bluetooth® information is displayed in the display. The screen is switched by touching the tab for each function to be used. Do not press the panel strongly or press it with a sharp-pointed object. The microphone is used for speaking voice commands or exchanging conversation. The basic functions of Bluetooth® Hands-Free can be used for such things as making calls or hanging up using the talk button, pick-up button and hang-up button on the steering wheel. The power/volume dial of the audio unit is used to adjust the volume. Turn the dial to the right to increase volume, to the left to decrease it. The volume of the audio unit cannot be adjusted while Bluetooth® Hands-Free is being used. To use Bluetooth® audio and Hands-Free, the device equipped with Bluetooth® has to be programmed to the unit using the following procedure. A maximum of seven devices including Bluetooth® audio devices and Hands-Free mobile phones can be programmed. • For your safety, a device can be programmed only when the vehicle is parked. If the vehicle starts to move, the pairing procedure will end. Park the car in a safe place before programming. • The communication range of a Bluetooth® equipped device is about 10 meters (32 ft) or less. Some Bluetooth® mobile devices are not compatible with the vehicle. list of pairing devices is displayed. the message and switch to the device operation. 4. Using your device, perform a search for the Bluetooth® device (Peripheral device). 5. Select “Mazda” from the device list searched by the device. Input the displayed 4-digit pairing code into the device. The pairing is performed automatically. Verify the displayed 6-digit code on the audio unit, which is also displayed on the device, and touch the on-screen button. Call history (incoming/outgoing history) for the device is downloaded automatically. After a device is registered, the system automatically identifies the device. By activating Bluetooth® Hands-Free again, or by activating Bluetooth® Hands-Free first after switching the ignition from OFF to ACC, the device connection condition is indicated in the display. If several devices have been programmed, the Bluetooth® unit links the device last programmed. If you would like to link a different programmed device, it is necessary to change the link. The order of device priority after the link has been changed is maintained even when the ignition is switched off. If the device name cannot be displayed, “...” is added at the end of the title which is displayed. 1. Touch the on-screen tab. 2. Touch the device name which you want to connect to display the device information screen. on-screen button to connect as a Bluetooth® audio device. 3. Touch the device name which is currently connected to display the device information screen. 3. Touch the device name which you want to delete. If you want to delete all of the pairing devices, perform the restore default. PIN code (4 digits) can be changed. 3. Delete the PIN code which is currently set. 4. Input the new PIN code to be set. All the pairing device information and phonebook data can be deleted. • English • Spanish • French Refer to Setup 5. The Mazda Bluetooth® Hands-free system can be used to make calls using voice recognition which includes numerous convenient commands. In this section, the basic operation of the voice recognition is explained. To Activate the Main Menu: Press the talk-button. To Activate the Phone Menu: Press the pick-up button. After activating the main menu, say “Phone”. To Activate the Navi Menu: After activating the main menu, say “Navigation”. For voice recognition details with the navigation system, refer to the separate “NAVIGATION SYSTEM Owner's Manual”. • Press and hold the talk-button. • Press the hang-up button. Press and release the talk-button. • The Bluetooth® Hands-Free system is operable several seconds after the ignition is switched to ACC or ON (requires less than 15 seconds). • When operating the audio unit or the A/C while using Bluetooth® Hands-Free, the beep sounds or voice guidance (audio unit)/ cannot be heard. The tutorial explains how to use Bluetooth® Hands-Free. 1. Press the talk button. “Ready” 3. Say: [Beep] “Tutorial” 4. Follow the prompts to receive the appropriate voice guidance instructions. “Help” , “Go Back” , “Cancel” , “Display OFF/Display ON” are commands which can be used at anytime during voice recognition. The help function informs the user of all the available voice commands under the current conditions. 1. Say: [Beep] “Help” 2. Follow the prompts to receive the appropriate voice guidance instructions. This command is for returning to the previous operation while in the voice recognition mode. The Bluetooth® Hands-Free system transitions to standby status if the following operation is performed while the system is activating. The audio unit display can be switched off/on by voice recognition operation. • The Hands-free system cannot perform voice recognition while voice guidance or a beep sound is operating. Wait until the voice guidance or the beep sound is finished before saying your commands. • Dialects or different wording other than Hands-Free prompts cannot be recognized by voice recognition. Speak in the wording specified by the voice commands. • It is not necessary to face the microphone or approach it. Speak the voice commands while maintaining a safe driving position. • Do not speak too slow or too loud. • Speak clearly, without pausing between words or numbers. • Close the windows and/or the moonroof to reduce loud noises from outside the vehicle, or turn down the airflow of the air-conditioning system while Bluetooth® Hands-Free is being used. • Make sure the vents are not directing air towards the microphone. If the voice recognition performance is not satisfactory.